A while back I mentioned that I’m not much of an electrician, and this tutorial pretty much puts the exclamation point on that thought. 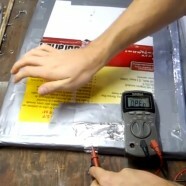 I’m pretty sure there should be more than just cardboard and aluminum foil needed to generate power of any kind, but that’s literally all that’s needed to power the Pressure Plate that Rick Osgood made in this tutorial. It’s a great way to save a few bucks and still get a trigger for your props!